All transactions are safe and secure with a reliable history in online purchasing behind each of our associates. 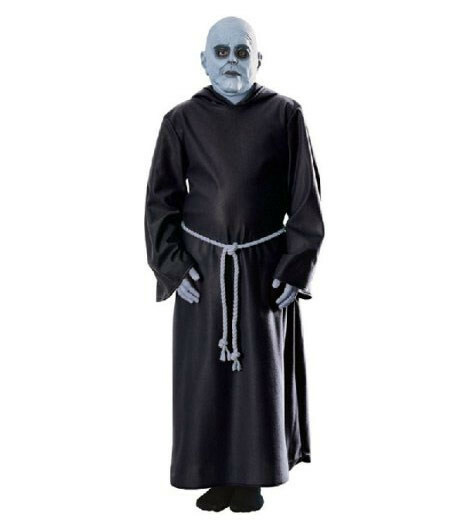 Buy the Uncle Fester Costumes to own Addams Family clothing and merchandise. An Addams Family costume is always an ideal way to celebrate Halloween and this Uncle Fester costume is no exception. It is available in child and adult sizes, so anyone who has the desire to be Gomez's shy brother can. To incorporate the whole family, convince other members of your clan to dress up too. The Wednesday Addams costume above could win any gal's vote, the Pugsley costume shirt is an easy option, and the Gomez and Morticia Addams costumes are just right for any couple. They are all great in their own way, so don't miss out on the creepy and kooky fun! In addition to the Uncle Fester Costumes above, browse the Addams Family Clothing Gallery for more apparel like men's and women's clothes, kids shirts or hoodies.